FORT HOOD, Texas — The U.S. Army, General Motors (NYSE: GM) and Raytheon Company (NYSE: RTN) hosted a graduation ceremony Tuesday for the first Shifting Gears: Automotive Technician Training Program class. Created from a multi-year partnership between the two companies and the Army, the 12-week, on-base program empowers transitioning soldiers with the skills required to secure careers as service technicians nationwide at GM dealerships nationwide. Twenty-three soldiers received their certification as GM technicians during the ceremony. Shifting Gears equips soldiers with technical expertise and experiential training, building on core Army disciplines to provide students with invaluable self-management and problem-solving skills. Shifting Gears is part of the Army’s Soldier for Life support program, helping soldiers reintegrate into their communities after leaving the Army. Upon successful course completion and program graduation, veterans receive career counseling, job-placement recommendations and employment assistance from Army Soldier for Life centers, and access to available GM technician employment opportunities through GM’s authorized dealer network. With thousands of military veteran employees, General Motors’ support for the United States armed forces spans generations. Today, Chevrolet assists Cell Phones for Soldiers, Achilles Freedom Team of Wounded Veterans, a variety of employment and grassroots initiatives, and is the Official Vehicle of the Army-Navy game. The GM Military Discount program offers discounts on most Chevrolet, Buick and GMC vehicles for active duty, reserves, retirees, veterans (within one year of separation) and spouses of the U.S. Air Force, Army, Navy, Marine Corps, Coast Guard and National Guard. GM proudly participates in the U.S. Chamber of Commerce Foundation’s Hiring Our Heroes initiative aimed at finding meaningful employment for veterans transitioning to civilian life. DETROIT – If your car gets swarmed by zombies, would you know what to do? While that question may seem far-fetched, car safety is an integral part of ensuring every little vampire and mummy gets home safely after trick-or-treating. Chevrolet and OnStar are sharing Halloween safety tips and three “Hey, they could happen!” OnStar calls for encounters with monsters and other creepy characters. OnStar created the just-for-fun recordings of how advisors could assist drivers in unreal situations. These incidents might be imagined, but they point out just how seriously OnStar and Chevrolet take their commitment to helping ensure a fun and safe Halloween. Listen to how a Malibu can protect you if a Zombie apocalypse breaks out. In this one, OnStar answers the question: For what would Edgar Allan Poe use a Silverado? Finally, OnStar advice for how to stop a Werewolf from following you. · Slow down and be especially alert in residential neighborhoods. Children are excited on Halloween and may move in unpredictable ways. · Take extra time to look for kids at intersections, on medians and on curbs. · Enter and exit driveways and alleys slowly and carefully. · Eliminate any distractions inside your car so you can concentrate on the road and your surroundings. · Drive slowly, anticipate heavy pedestrian traffic and turn your headlights on earlier in the day to spot children from greater distances. · Popular trick-or-treating hours are 5:30 p.m. to 9:30 p.m. so be especially alert for kids during those hours. OnStar, LLC (OnStar) is a wholly owned subsidiary of GM Holdings LLC (“GM”). Along with its affiliate Shanghai OnStar Telematics Co. Ltd (a joint venture involving OnStar, Shanghai General Motors Co., Ltd (SGM) and Shanghai Automotive Industry Corporation (SAIC)), OnStar serves more than seven million subscribers in North America and China. OnStar is a provider of connected safety, security and mobility solutions and advanced information technology. OnStar's key services include automatic crash response, stolen vehicle assistance, remote door unlock, turn-by-turn navigation, vehicle diagnostics and hands-free calling. 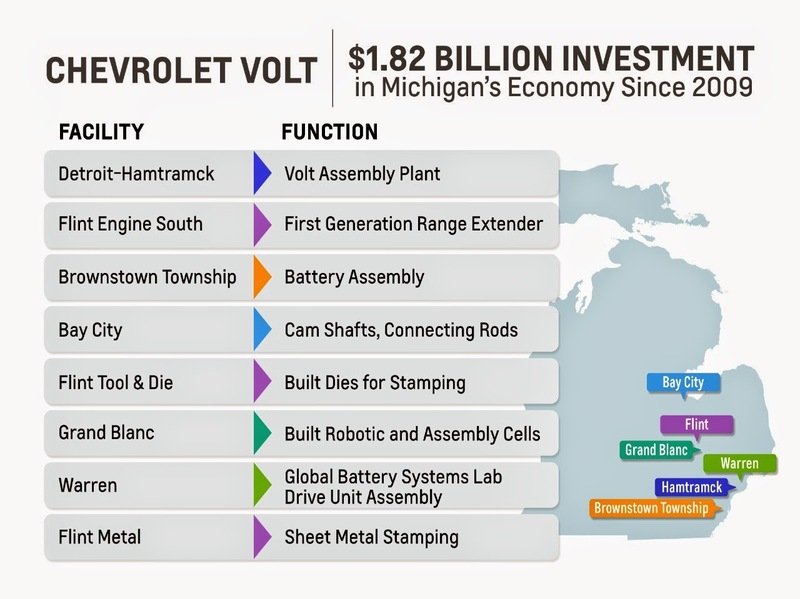 · Chevrolet Volt electric drive unit to be built in Warren, Mich.
DETROIT –Today at the Detroit Economic Club, General Motors Co. (NYSE: GM) CEO Mary Barra will confirm that the company’s Warren Transmission Plant will build the electric drive unit for the second-generation Chevrolet Volt. That means most major Volt powertrain components – from its battery cells to its range-extender – will be made in Michigan, establishing the state as the company’s global engineering center of excellence for vehicle electrification. At the same time, Barra will announce capital investments of nearly $300 million in Michigan between now and the end of the year. Details will be announced later. Since 2009, GM has announced more than $11 billion in investments in the United States, with almost half of that investment committed to Michigan. In addition, GM has worked with its UAW partners to develop initiatives that will lead to more than 22,600 jobs in the United States. This hiring has begun and will continue over the next few years, and many of these jobs will be based in Michigan. Approximately $1.82 billion in capital has been invested in projects dedicated specifically to vehicle electrification. · GM’s Brownstown Township facility is the country’s first high-volume lithium-ion battery pack manufacturing site operated by a major automaker. · The Chevrolet Volt and Cadillac ELR are assembled at GM’s Detroit-Hamtramck assembly plant. GM’s Flint Engine Operations will build the 1.5-liter, four-cylinder range extender for the Volt. The unit is part of an all-new engine family. · Warren Transmission will build the GM Voltec Multi-Mode Electric Drive Unit, which allows the Volt to drive in pure electric or extended range electric mode. Battery cells for the Volt and ELR are produced by LG Chem in Holland, Mich., and the Volt’s vehicle’s electric motors will also be made in the United States. Within the first year of production, about 70 percent of the Volt’s parts will be made in the United States or Canada, which GM believes is the most for a plug-in or conventional hybrid. · Since the Volt was launched in 2010, owners driving in pure electric mode have helped reduce gasoline consumption by more than 25 million gallons. · Based on a GM study of more than 300 2011-2012 model year Volts in service in California, many owners exceed the EPA-rated label of 35 miles of EV range per full charge, with about 15 percent surpassing 40 miles of range. · Volt owners who charge regularly typically drive more than 970 miles between fill-ups and refuel less than once a month. The 2014 Volt provides owners with EPA-estimated fuel economy of 98 MPGe (electric) and 35 mpg city/40 mpg highway on gasoline power. · Nearly 70 percent of Volt buyers are new to GM. The Toyota Prius is the most frequently traded-in vehicle for a Volt. · Volt is the most successful plug-in electric vehicle in the United States, with cumulative sales of more than 69,000 vehicles. In this press release and in related comments by our management, our use of the words “expect,” “anticipate,” “possible,” “potential,” “target,” “believe,” “commit,” “intend,” “continue,” “may,” “would,” “could,” “should,” “project,” “projected,” “positioned” or similar expressions is intended to identify forward-looking statements that represent our current judgment about possible future events. We believe these judgments are reasonable, but these statements are not guarantees of any events or financial results, and our actual results may differ materially due to a variety of important factors. Among other items, such factors might include: our ability to realize production efficiencies and to achieve reductions in costs as a result of our restructuring initiatives and labor modifications; our ability to maintain quality control over our vehicles and avoid material vehicle recalls; our ability to maintain adequate liquidity and financing sources and an appropriate level of debt, including as required to fund our planned significant investment in new technology; the ability of our suppliers to timely deliver parts, components and systems; our ability to realize successful vehicle applications of new technology; and our ability to continue to attract new customers, particularly for our new products. GM's most recent annual report on Form 10-K and quarterly reports on Form 10-Q provides information about these and other factors, which we may revise or supplement in future reports to the SEC. DETROIT – In 18 months, the durability team at General Motors’ Milford Proving Ground can put a vehicle through an entire lifecycle. Durability tests are long, repetitive and physically demanding. “In 90 years, what hasn’t changed is that durability testing is physical,” said Stephen Jenkins, director, Global Proving Ground Operations, Test Labs and Vehicle Material Engineering. “We can mathematically calculate how well a part should hold up under certain conditions, but it isn’t until we get a driver in the product and test over and over again that we can be sure. Here are some of the benchmarks a vehicle must endure before the Milford durability team will release it for production. “We are always pushing ourselves to test even the smallest part of a vehicle to ensure that the entire product from the engine down to the screws and bolts are tough enough to handle the driving our customers need,” Jenkins said. 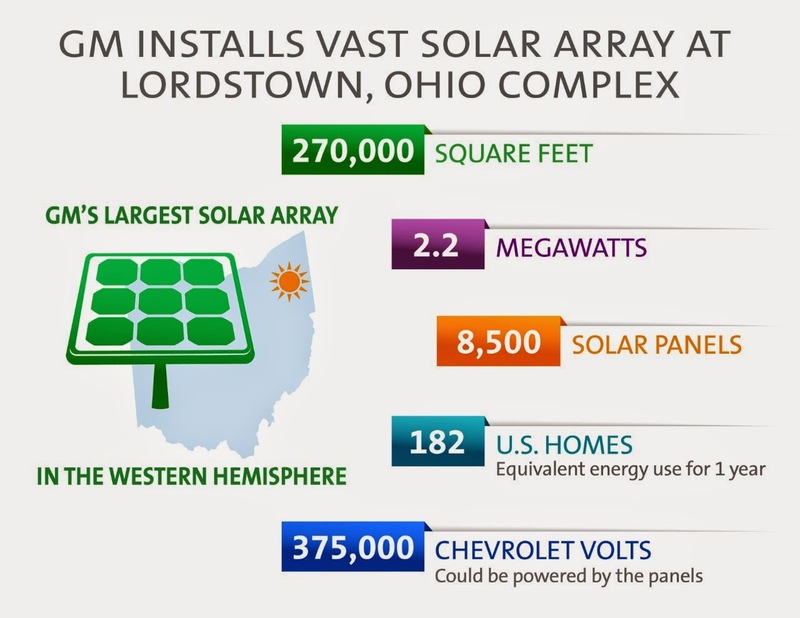 LORDSTOWN, Ohio – General Motors’ new 2.2 megawatt ground-mounted solar array will be complete by the end of 2014 at its Lordstown Complex, home of the Chevrolet Cruze. When the last of more than 8,500 solar panels are in place, it will be GM’s largest solar installation in the Western Hemisphere. The renewable energy produced by the array is enough to power nearly 1.5 percent of the plant and helps avoid the equivalent of 1,993 tons of carbon dioxide emissions from entering the atmosphere. That is equivalent to the amount of carbon pulled from the air by 1,634 acres of U.S. forests in one year. “With more solar installations than any other automotive company and the second-highest percentage of solar among all commercial users, GM shows that manufacturing and the use of renewable energy can go hand-in-hand.” said Rhone Resch, president and CEO of the Solar Energy Industries Association. Easily seen from the Ohio Turnpike, the array will stand as a visual cue to the more than 49 million travelers who pass it each year that GM is committed to the use of solar power. This announcement comes nearly one year after announcing completion of the 1.8 megawatt solar array on the rooftop of GM’s Toledo Transmission facility, also in Ohio. That array is the largest rooftop array in the state, producing enough energy to power 149 homes in the United States for a year. “You don’t often think of the Midwest when you think of ideal locations for solar, but reduced costs and increased utility rates have made sites like Lordstown and Toledo optimal locations to expand GM’s use of solar power,” said Rob Threlkeld, GM global manager of renewable energy. The Solar Energy Industry Association, which named GM a “Solar Champion” last year at this time, has released its Solar Means Business 2014 Report. GM is listed among the top 25 corporate users of solar power in the United States for the second consecutive year. “We applaud General Motors for setting the pace when it comes to automotive manufacturing solar installations and deployment,” Resch said. With the Lordstown project, GM remains on track to meet a company goal of 125 megawatts of renewable energy deployed globally by 2015. For more information on GM’s environmental commitment, visit its sustainability report and environmental blog. DETROIT – Chevrolet today previewed several performance-oriented concepts of some of the brand’s most popular passenger cars, including the SS Sport, Sonic, Impala and Cruze. They will debut Nov. 4-7 in Las Vegas at the SEMA Show, the world’s largest convention of automotive aftermarket parts and accessories. . The SEMA concepts feature accessories designed to allow personalization while maintaining excellent refinement and ride characteristics. General Motors’ engineers developed most of the accessories shown on the concept vehicles. Some accessories are available from Chevrolet dealers, while others are being evaluated for production. 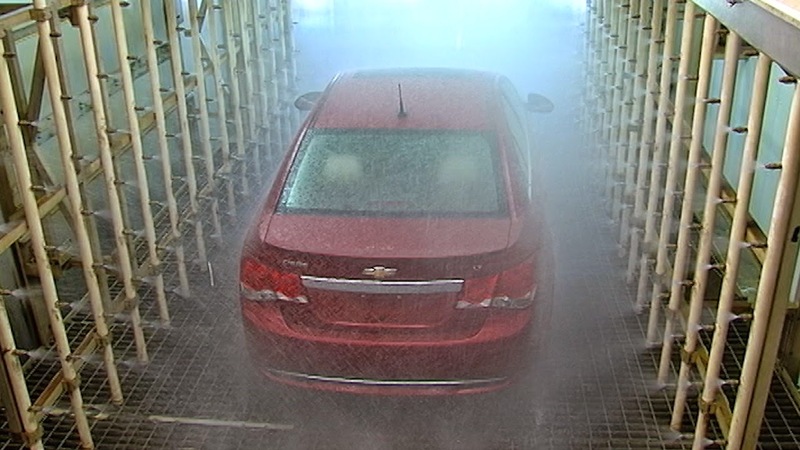 The available accessories are designed, engineered, tested and backed by Chevrolet to be installed by a Chevrolet dealer, which maintains the vehicle warranty – a claim aftermarket manufacturers cannot make. Leading Chevy’s SEMA charge is the SS Sport concept, followed by a pair of street-savvy subcompact Sonic concepts, a sinister-looking Impala Blackout concept and a sportier take on the Cruze RS. Inspired by Chevrolet’s motorsports heritage and its Australian lineage, the SS Sport concept gives the V-8-powered sports sedan a makeover that reflects its performance capability. · Chevrolet Accessories floor mats and cargo tray with the Holden logo. Power for the Chevrolet SS comes from the LS3 V-8, delivering an SAE-certified 415 horsepower (310 kW) and 415 lb-ft of torque (563 Nm). For 2015, it is available with a new six-speed manual transmission, along with a six-speed, paddle-shift automatic. Additionally, the 2015 SS receives standard Magnetic Ride Control – the world’s fastest-reacting damping system – which provides more precise body motion control that correlates with a more responsive, more refined ride. Also new are Brembo rear brakes that complement the Brembo front brakes that have always been part of the SS’s equipment. This performance-oriented Sonic hatchback concept draws on the legacy of Chevrolet’s high-performance vehicles reimagined for a new generation of enthusiasts. The Sonic Performance concept features engine performance, suspension/brakes and appearance upgrades designed to be installed by Chevrolet dealers for quicker and easier personalization. · Chevrolet Accessories carpeted floor mats, door sills and sport pedals. The Sonic Performance concept features an advanced safety package including forward collision alert and lane departure warning – crash-avoidance technologies typically found on cars costing more – as well as a rear vision camera. It also features 10 standard air bags and Bluetooth phone connectivity – just like every production Sonic in the 2015 lineup. Built to highlight the personalization possibilities, Sonic Accessories concept allows mixing and matching of the latest accessories for unique treatments. The Sonic Accessories concepts also packs a Kicker® subwoofer and amplifier to complement its street-smart style with the appropriate decibels. Under the hood is the Ecotec 1.4L turbo rated at 138 horsepower (103kW) and 148 lb-ft of torque (200 Nm) of torque between 1,850 and 4,900 rpm. The wide rpm range for the maximum torque – a specific trait of turbocharged engines – helps the engine deliver a better driving experience and performance. Redesigned a year ago, the 2015 Chevrolet Impala builds on the attributes that made it one of the most acclaimed new cars of 2014 – including being named the Cars.com Best Car of 2014 and one of Kelley Blue Book’s 12 Best Family Cars for 2014. Chevrolet Accessories black grille surround, rear spoiler, painted mirror caps and 19-inch aluminum wheels. The all-black, leather-trimmed interior features custom trim plates with a wire mesh pattern, along with Chevrolet Accessories stainless steel sills – with the Impala logo – and a sport pedal kit. The Impala Blackout also rocks with the production model’s available 11-speaker Bose® Centerpoint® Surround Sound System, which connects to the Chevrolet MyLink system via an eight-inch-diagonal color touch screen. The Impala’s available 3.6L V-6 engine, rated at 305 horsepower (227 kW) and 264 lb-ft of torque (358 Nm), powers the Blackout concept. It is the segment’s most powerful naturally aspirated V-6 engine. Cruze is the cornerstone of Chevrolet’s North American small-car lineup, which is attracting a greater share of the market and more young, first-time customers visiting Chevy showrooms. It is also Chevrolet’s best-selling car around the world, with more than 3 million units sold globally since its launch in mid-2010. The 2015 Chevrolet Cruze in North America receives revised exterior styling, enhanced interior convenience and greater connectivity – including new Text Message Alerts, Apple Siri integration and OnStar 4G LTE with available built-in Wi-Fi hotspot. An available RS package includes unique fascias, rocker moldings, rear spoiler and fog lamps, while an uplevel instrument cluster includes chrome accent rings in place of the standard silver finish, and opaque cluster bezels that allow the cluster’s ice blue backlighting to shine through for a sporty nighttime appearance. The Cruze RS Plus concept accentuates the distinctive, upscale styling cues of the 2015 Cruze RS with a custom Wildfire Metallic exterior, along with unique lower body moldings and a custom rear spoiler. A twin-stripe package in matte black is available from Chevrolet Accessories. Inside, the Jet Black interior shines brighter with a Chevrolet Accessories ambient lighting kit and illuminated door sills. It also features a sport pedal kit and a Kicker® subwoofer and amplifier kit. Under the hood, the concept’s aggressive styling is matched with a performance-enhancing stage kit from Chevrolet Performance, as well as a concept fresh-air intake system for the 1.4L turbo engine. Founded in 1911 in Detroit, Chevrolet is now one of the world's largest car brands, doing business in more than 140 countries and selling more than 4.9 million cars and trucks a year. Chevrolet provides customers with fuel-efficient vehicles that feature spirited performance, expressive design, and high quality. More information on Chevrolet models can be found at www.chevrolet.com. DETROIT – General Motors Co. (NYSE: GM) sold 2,449,595 vehicles around the world in the third quarter of 2014, up 2 percent compared with a year ago. It was the company’s best third quarter since 1980. In the first nine months of 2014, GM sold 7,371,743 vehicles, up 2 percent. Third quarter sales in the United States and China, the company’s two largest markets, were up 8 percent and 14 percent, respectively. Year to date, sales in the United States and China were up 4 percent and 12 percent, respectively. GM is on track to surpass sales of 3 million vehicles in China for the second consecutive year and the company expects to top last year’s record sales of 3.16 million vehicles. During September, GM’s cumulative sales in China surpassed 20 million vehicles. 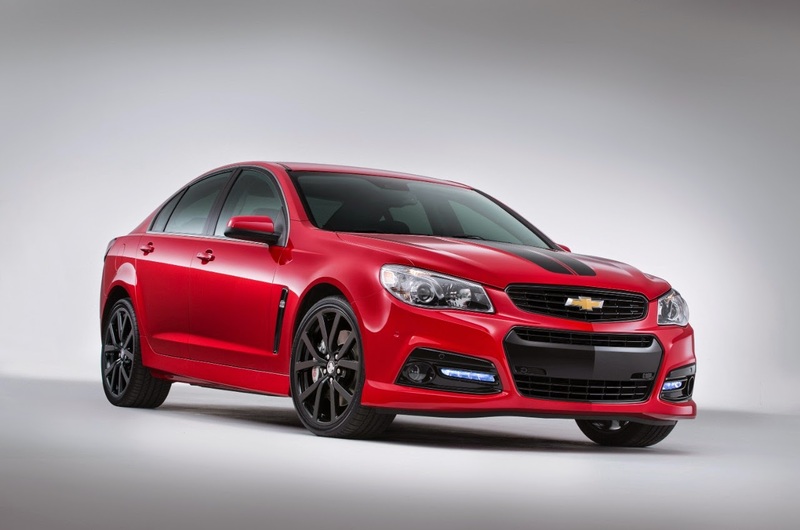 · Chevrolet had record sales in China in the third quarter, up 13 percent to 169,830 units. For the first nine months of year, the brand is up 7 percent to a record 505,316 units. September was Chevrolet’s best month ever in China. · Calendar year to date, Chevrolet sales in South Korea are at record levels. · The success of the new Chevrolet Silverado and GMC Sierra helped GM increase its estimated share of the U.S. retail market for large pickups from 35.8 percent in the first quarter of 2014 to 37.4 percent in the second quarter and 37.9 percent in the third quarter. · Buick’s global sales were up 7 percent in the third quarter to 284,540 units and they are up 11 percent calendar year to date to 858,046 units, driven by strong growth in the United States and China. Buick’s China sales were up 8 percent in the quarter to 220,578 units and they were up 11 percent to 670,999 units in the first nine months of the year. · In China, combined, sales of small SUVs – the Buick Encore, Chevrolet Trax and Captiva – were up 90 percent in the third quarter. In the United States, the Buick Encore has been the best-selling vehicle in its segment for six months in a row. The Chevrolet Trax will launch in the United States in early 2015. · Cadillac’s global sales were up 4 percent in the third quarter and they are up 9 percent year to date, driven by strong growth in China. Cadillac’s China sales were up 48 percent in the quarter to 18,665 units and they were up 63 percent to 52,425 units in the first nine months of the year. · Opel/Vauxhall gained market share in 11 European countries in the first nine months of this year, including Germany, where the brand earned 7 percent of the market, up 0.3 points.